The lands of Arizona had been under Spain and then Mexico’s control and influence for centuries. Before the Europeans were the native Indian tribes of Navajos, Apache, Hopi and Zuni, some dating back to 15,000 BC. Centuries before the Spanish; the Hopi and Zuni had their cliff-dwelling villages. The Apache and Navajos had established villages throughout the area. The explorers of Spain came in the mid-1500s. 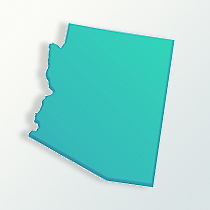 Under Spanish rule the Arizona lands were a portion of the present-day Sonora, and the area was known as Pimeria Alta (land of the Upper Pima). The Spanish had the hardest time dealing with the Apaches, so the number of settlements were limited, even into the late 1700s. The mining for minerals kept the Spanish present in the region. Mexico eventually had the former Spanish lands as part of the Mexican State of Vieja California Mexico had its independence from Spain in 1822. The Untied states acquired the region of Arizona after Mexico’s defeat in the Mexican-American War of 1848. In 1849 with so many people heading west for the California gold rush, many passed through Arizona territory. Those who were unsuccessful in California returned to settle in Arizona, an interesting aspect of Arizona genealogy. With the Gadsden Purchase of 1854, those lands are ceded to the United States. During the American Civil War, the Arizona Territory was unprotected with the military needed in other regions. Hostilities between the Native Indians and Arizona settlers began in 1861 and continued until 1886. Eventually most Indian tribes were removed from the best ranching and farming areas to be kept in isolated reservations. Starting in the mid-1800s, the Mormon Church in Utah sent many of its people to settle lands in the northern end of Arizona and New Mexico. This added to the diversity of the land and important in Arizona genealogy. The Arizona area produced boom towns due to rich veins of silver, gold and other minerals located. Once the veins were tapped out, the boom towns became ghost towns. It remained a territory of the United States until February 14, 1912 when it was admitted as the 48th state. The population at the time was approximately 250,000 and by the end of the 20th century it had about 6.5 million residents. New industries during the 20th century flourished; such as copper mining, cotton production, farming and then a Motorola manufacturing plant was established in 1948. A huge labor source especially for manual labor has been those of Spanish-Mexican descent. Due to warmer climate in Arizona it also has become a favorite for tourists. With the Grand Canyon at the north end of the state, the state always draws millions of visitors. In the state today, 73 percent of the population speak English, with 21 percent speaking Spanish mostly and then 1.5 percent speaking the Navajo language. The total population has 58 percent considered white (non-Hispanic) and 30 percent as Hispanic. The Native Indian populations are very high with over 85,000 Navajoes and 10,403 as Apaches.